Barcelona and France defender Eric Abidal, who had surgery on a liver tumour in March, is hoping to be back to full fitness for the Champions League final at the end of this month. Abidal drew by far the biggest cheer of the night at the Nou Camp on Tuesday when he came on as a substitute in the closing minutes of the semi-final second leg that Barca drew 1-1 with arch rivals Real Madrid to advance 3-1 on aggregate. 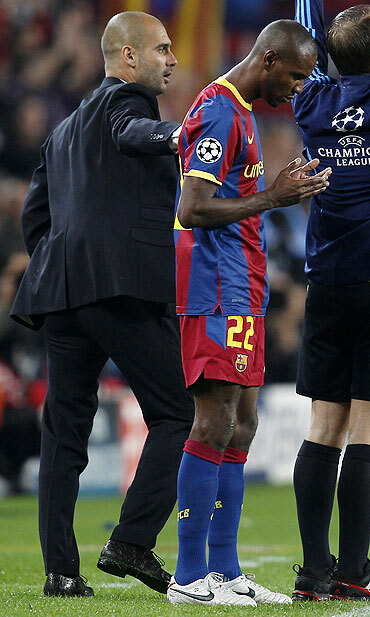 "I hope to be ready for the final," the popular Abidal, who had been on superb form before the operation, told reporters. "I have never experienced this before," he added, referring to the incredible reception he was given by the nearly 100,000 fans thronging the vast arena. "I can sense that the people love me and I love them too and will try to do my best for them on the pitch, as always. "I am feeling fine, I didn't do anything for three weeks and now I'm working hard. My dream was to come back and help the team with so many injuries." Abidal's absence along with injuries to centre back Gabriel Milito and fullbacks Maxwell and Adriano left coach Pep Guardiola short in defence and he was forced to deploy midfielder Javier Mascherano in the middle alongside Spain international Gerard Pique. Captain Carles Puyol, who typically plays in the centre, took Abidal's usual position of left back as Barca successfully nullified Real's formidable forward line including Cristiano Ronaldo, Gonzalo Higuain and substitute Emmanuel Adebayor. "I am happy for the group and the fans," Abidal said after Barca, the 2009 winners, qualified for their second final in three seasons and a meeting with English Premier League leaders Manchester United or Bundesliga side Schalke 04. They will return to London's Wembley stadium on May 28, the scene of their first triumph in Europe's elite club competition in 1992, which Guardiola took part in as a player. "Let's see if we can complete the cycle," Abidal added. "I remember how they won in 1992 and I'd like to do it again. But there is a lot of training and matches in between, we have to take this game step by step."